We Lovely Dozen have a bit of a history with the county fair – a history of not totally awesome, to be more exact. Last year, we were invited to perform only to discover the day of our set that we’d been moved to an uncovered stage – in the rain. We decided to take our show back to our dance home for anyone who wanted to join us. So when we found out Wednesday that we’d been invited to dance again (today, actually), we were understandably a bit on edge. Not a photo from today, but me in the same outfit (more or less). We were indoors this time around, in a space with an asphalt floor, no sound system, and (kinda terrible) echoes. Also, it was a building at the fair – lots of coming and going, shouting and crying (next to the face painting for the kids). Complaining about our dance space, however, is not the purpose of this post. After our set, which ended with an audience participation song, we had a little girl (maybe 5) come up to us with her mother. 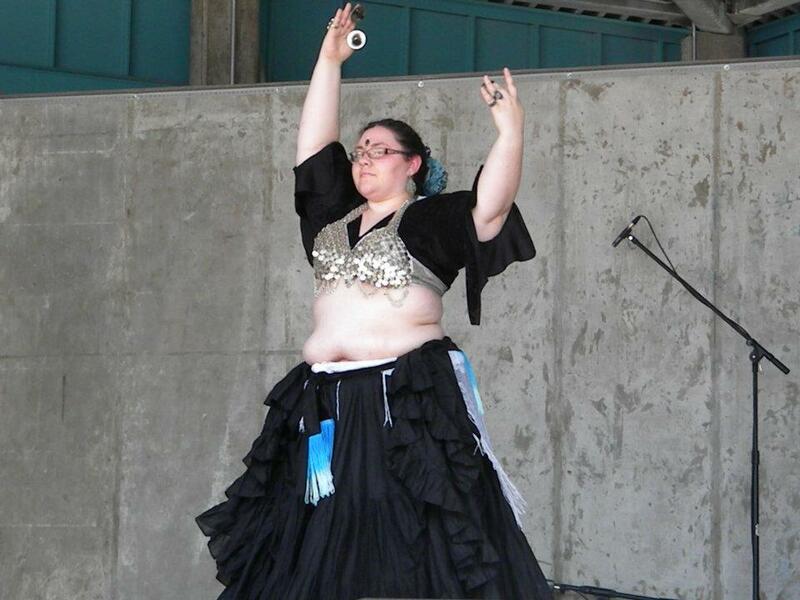 We tried to get her to dance, but as little folks often are, she was too shy to move. The look in her eyes as we danced was the most beautiful thing I’ve seen in a long time. She then wanted a picture with the “pretty girls”! Moments like this stick with me. I remember reading some time ago in some book by Scott Cunningham (perhaps Living Wicca?) the idea of seeing the Divine in the eyes of children as they explore the world, as they learn, as they grow. And it is beautiful. This week has been full of nothing but wake-up calls. It figures that this would happen around Midsummer – the time when the earth is fully awake and totally alive. Aside from these clear signs to pay attention, Spirit is also giving me a big push, energetically speaking, to move forward – onward and upward, shifting and changing – GO! Speaking of Midsummer – we here in the Midwest were treated to a different version of the solstice then usual. Generally, it’s a hot sunny day; great for really feeling the fire of the sun, the power of the Sun God. Today, however, was rainy in the morning and stormy in the evening – a different sort of power, but power nonetheless. Washing away any stubborn bits of the past season (of the earth and your life, of course) and leaving a ready field for new growth. P.S. This is my Midsummer jam this year. Yup, that’s right – I’m gearing up for another intro level rune workshop. Though I have to say I leaned a few things from my last workshop and have developed some tips to keep in mind. 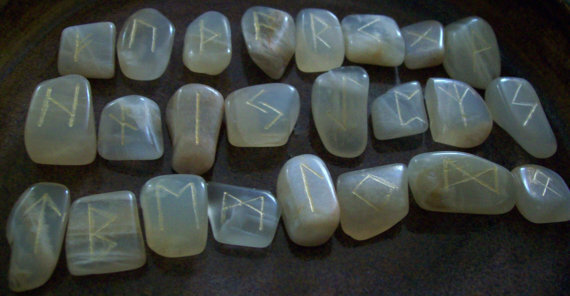 At my last workshop, I had each person create a set of runestones – I feel like this was maybe not the best course of action, as it may have put too much emphasis of the medium rather then the energies. You don’t need a set of stones or cards to learn the runes – in fact, once you know them you can transcend the limitations of a physical rune set. There have been many occasions when I wanted to use the runes but had no set with me. So I made one, on the spot with paper and a pen. I want to convey this to my next class, and as such we’re not making rune sets. All too often rune books focus on the external meanings of the runes without taking some time to explore the immanent and internal nature of the runes. This was something I realized while reading Runes for Transformation by Kaedrich Olsen. In this book is an exercise in which you try to uncover the runes in all things; a boat, an airplane, a tree, and anything else you can think of. I’ve decided to include this exercise in my workshop this time around. This is something I tried to cover in my last workshop without much success, but I think it’s important to at least introduce to new students of the Futhark. Ultimately I’d like to introduce my new students to: transliteration (writing in runes), bindrunes, divination, and galdr if it seems fitting. Not to say that these students mus learn or use all of these techniques. Rather, I feel knowing they exist will help them better understand that vastness of the runes. This is something I’m coming to understand through my recent journeys. And I want these students to know that it’s okay for them to come to their own conclusions and that their opinions and experiences will influence exactly how they understand the runes. To this end, I’ve decided to lead a guided meditation to help each student find his/her rune of power (more on this later) – that is a rune that is important for him/her to connect with at this time. I quickly went from weirdly relieved to feeling totally surreal as I waited for Obama to make his statement. Listening to his statement I really latched on to the message he was trying to send about unity and peace. The destruction of this powerful symbol is something that will allow for deeper healing to finally occur. 11:00 pm – I was then watching footage of the crowd outside the White House – flying flags, singing, cheering. A part of me felt joy watching my fellow citizens come together – unite – in celebration. And another part of me felt a bit horrified at the celebration of someone’s death. Soon after, a friend on Twitter made this statement: “I apologize for the fact that this country, this world, resorts to murder as a form of justice.” And as much as I know I felt relief but an hour before, I realized that she was partly right. Everyone is talking about how this is justice. As the strange i-can’t-believe-this-actually-happened feeling passed, I felt that I would much rather have seen Osama captured alive and put on trial. Is it possible that this was the purpose of this operation? Sure, but I doubt it was. 12:00 am – People began to frighten me, talking about how they wish they could have been there to spit in his face and hope he burns in hell, calling this a happy ending. I was disgusted. It’s one thing to be grateful that a terrorist is no longer able to terrorize but it is another entirely to relish in his death and wish such pain on another human being. Now I realize I sound a bit hypocritical, but hear me out. I believe that Osama Bin Laden was a “bad” person, willing to kill innocent people. But I also believe that all life is sacred, even if that life has been given to a “bad” person. But what really breaks my heart is that many of these remarks relishing his death came from my fellow Wiccans. 1:00 am – I began to write this, trying to sort out how I feel and how I ended up feeling that way. Another Twitter friend put it well: “Call me a hippie. Perhaps it’s what I am. But I cannot celebrate the death of any man.” I can, however, celebrate the destruction of a symbol, the promotion of unity, and the promise of healing. I’ve been experimenting with homemade lip balms for a little while, and now I’ve taken the first big step towards really making something of this: I’ve put about 50 of my lip balms on consignment at my local new age shop (because they love hand-made things). I was even working when the first one sold! This is so fulfilling, but it’s something I’ve never considered really making anything of – but I’m starting to think that perhaps I can. I adore natural “beauty products” that are good for me and good for the earth. When I say “beauty products” I really mean products that make me feel beautiful not products that make me beautiful – because I already am. The same holds true of everyone else who uses my products. The point is to nourish yourself, love yourself, and realize that you are beautiful and amazing as is.